Located at the ocean side of the main exhibit structure adjacent to the Circular Oceanarium, is a unique exhibit building housing Amazon fresh water porpoises. Within the exhibit, a semi-circular viewing area rims a series of large windows set in the wall of the tank. To the rear and overhead of the viewer, An Amazonian motif of tropical plants blend with a huge mural to encompass the visitor in the native world of the exhibit specimans, the Amazon of Peru. Within the center of this setting, swim the unusual animals which are as primitive as the scene which surrounds them. Generally, the White Amazon River Porpoise is known as Inia geoffrensis. In its native water or Iquitos, Peru it is called bufeo blanco or bufeo rojos, depending on size or color. The bufeo's coloration apparently varies with age. Most young animals are dark slate-gray above and slightly lighter below. The lower sides and belly are pinkish. 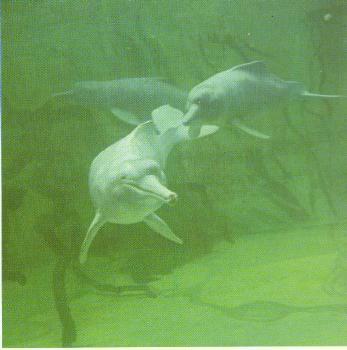 The light tone moves up the sides as the animal gets older until it is completely light or pinkish with a limited area of dark tone remaining about its breathing aperture, the blowhole, at the top of its head. Generally, these porpoises swim at top speeds of one or two miles per hour but may attain eight to ten miles per hour. Bottlenosed porpoises have been clocked at speeds in excess of 30 miles per hour and usually swim at about four and one-half miles per hour. The well developed flippers of the Inia seem to correlate with their slow swimming activities. They use their flexible flippers in a rowing-like action as opposed to the semi-rigid flippers of marine porpoises which serve mainly as hydroplanes. White Amazon porpoises are characterized by thick-set bodies, long low dorsal fins, a conspicuous forehead, tiny eyes adapted to life in murky water, and greatly elongated beaks with jaws of teeth specialized for seizing and chewing. The Amazon animals have a flexible neck which gives them a pronounced mobility of the head, a trait not shared by their marine cousins. Fresh water porpoises appear to be among the most primitive of living cetaceans. Little, if any, knowledge is available on their life cycles of birth and growth, senses, such as echo-location, temperament and intelligence. It is anticipated that additional information may be collected through observation and research with these animals at Marineland.